Our festive chocolate log is the perfect centrepiece for your Christmas meal! Preheat oven to 180°C (160°C with fan) Gas Mark 4. Beat the egg yolks with the sugar until they are light and fluffy. Sieve the cocoa powder and flour together and fold into the egg yolks. In a separate bowl beat the egg whites until they are light and fluffy, forming stiff peaks. Lightly fold the egg whites through the chocolate-egg mixture and then spread evenly over the baking parchment. Bake for 8-10 minutes until golden and springy to the touch. Remove from oven and tip onto a clean kitchen cloth. Remove the baking parchment and roll up gently in the towel. Set aside to cool completely. To make the filling, mix the melted chocolate with the Carnation Caramel and the half fat crème fraiche. 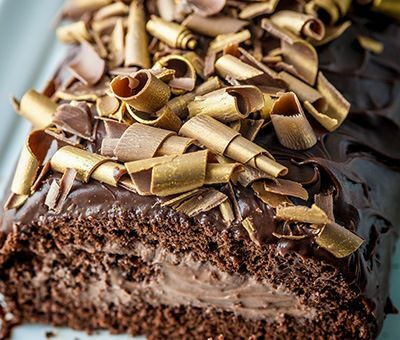 When the chocolate sponge is completely cool, unroll, spread the mix over the inside of the sponge and then gently reroll making sure the filling reaches the edges. Use the remainder of the chocolate filling mixture to spread over the outside of the log and then garnish with chocolate curls. Finally, decorate with the gold spray and serve. Chocolate Yule Log is rated 4.0 out of 5 by 1. Rated 4 out of 5 by Bonnie from Disappointed This was my first attempt at making a Yule log/Swiss roll. When the flour and cocoa was added to the beaten egg yolk and sugar mixture, it got very thick, dry and dough like. The egg white mixture was then very difficult to fold in without beating it too much which meant the final mixture had small lumps in it. However, the cake baked OK. What went wrong with the mixture? The filling and frosting is delicious but I found the quantities way too much for the size of cake and half the quantity was plenty. I would add a little more chocolate so it wasn't quite so gooey and set a little bit more. The overall result wasn't bad and was very popular at work with requests to make another one with a little rum in the filling/frosting for Christmas.